It's time to review one of the most important parts of the "Art of Grow" which is the Light source. Plants eat sunlight, converting the solar energy to chemical through the process of photosynthesis. And plants, just like us, are what they eat. The spectrum type, length, and intensity all play key roles in vegetative cultivation and overall plant health. Plants will grow tall, elongated stems without enough light because the plant is stretching to find additional energy rather than producing leaves to harness it. For indoor plants, this isn't an option. However, you simply can't drop a 1000 watt lamp over your plants and call it a day, a careful balance must be struck between the amount of light produced and the amount of waste heat generated—too much heat will shrivel plants like Shrinky-Dinks, especially sprouts and young seedlings. For those, Fluorescent bulbs are the superior choice. They produce very little head and therefore can be set very close to the tops of the plants, providing lots of light while keeping the plants from getting leggy or scorching. Despite what many amateur closet gardeners will tell you, no plant requires 24-hour sunlight. In fact, all sun and no shade makes Plant a dull boy. Plants perform a fair amount of their vegetative growth during the dark hours changes in the duration of a day affect flowering and fruit production. The preferred balance between light and dark varies between species though recommends 20 hours on with 4 hours off during the vegetative growth phase for everybody's preferred closet crop. Per Wikipedia, "The color temperature of a light source is the temperature of an ideal black-body radiator that radiates light of comparable hue to that of the light source." Colors above 5000K are known as cool colors (blue) and closely resemble natural sunlight. Colors below 3,000K are known an warm colors (red). The spectrum of light is important to horticulture because each spectrum triggers different responses from the plants—blue light induces vegetative growth, red light induces flowering. This in turn plays into which type of lighting rig you'll use and when—some types specialize in certain parts of the spectrum while others can span multiple wavelengths. Florescents produce a narrow spectrum of cool light that is unsuitable for triggering the flowering response in plants. If you want something to flower or bear fruit, stick it under a High Pressure Sodium lamp. HPS rigs produce light in the warm, red end of the spectrum which is a nearly universal reproductive trigger in the plant world. The corollary is that it does a piss-poor job of actually growing plants—they end up all gangly and scraggly if raised under only red light. 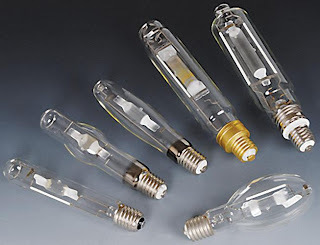 High energy efficiency - six times more light per watt output than an incandescent. LEDs are new on the scene but could well be the future of indoor grow operations. They work like any other LED light, a bunch of low-wattage LEDs are arrayed on a circuit board and produce light. LEDs are, unlike other High Intensity Discharge (HID) rigs, exceedingly energy efficient. This is because they're capable of producing the exact wavelength of light desired and no other. This means that an LED light programmed to shine at 5700K will shine at that an no other. Some LED rigs are also able to produce light at two distinct spectrum point simultaneously without any bleeding into other inefficient wavelengths and minimal heat production.